Every now and then some “know-it-all” who fancies himself a defender of science and a debunker of all things paranormal or supernatural will leave acerbic remarks in the comments section of this blog, stating how ridiculous it is to believe such blatant fraud, such ridiculous superstition, such utter folly. Actually, you find them all over the Internet, trying to sabotage spiritual books by bringing down the ratings, scoffing in self-righteous indignation at anything spiritual and “unscientific,” and just generally showing their own stupidity and closed-mindedness. Most of them know little about the subject matter, except what they have heard from the professional debunkers. They focus on the negative, completely disregarding the positive, while expecting various spiritual phenomena to neatly fit into some terrestrial mold that makes sense to them. Often, they lack the courage to give their real names, using a pseudonym or a variety of them. As I have said before, most of them seem to be still wet behind the ears and fresh out of Biology 101, where they were suddenly enlightened by some materialistic biology professor. Indications are that many of them were brought up in very religious homes and are rebelling against their parents by lashing out at their beliefs in public, not comprehending the difference between most of the subject matter discussed at this blog and religious dogma and doctrine. I sometimes wonder if their mindsets would be any different if someone like Professor Archie E. Roy (below) had been their mentor rather than some reductionist biology teacher. Dr. Roy was a professor emeritus of astronomy and honorary research fellow in the University of Glasgow, at the time he departed the material world, at age 88, on December 27, 2012. A distinguished man of science, he clearly was able to fit spirituality into his worldview. After receiving his B.Sc. from Glasgow University in 1950, Roy earned his Ph.D. in 1954. 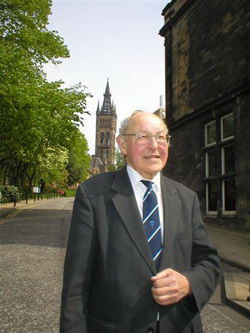 He joined the faculty of Glasgow University in 1958. He was a fellow of the Royal Society of Edinburgh, the Institute of Physics, the Royal Astronomical Society, the British Interplanetary Society, the Society for Psychical Research (of which he served as president for two years) and the Scottish Society for Psychical Research (of which he was the founder). He was also a member of the International Astronomical Union, which honored him for his work in astronomy by naming an asteroid after him. During his professional career, Roy investigated many paranormal cases and authored three books on paranormal subjects – A Sense of Something Strange (1990), The Archives of the Mind (1996) and The Eager Dead (2008). How some pseudoskeptical “know-it-all,” such as mentioned in the first paragraph, can claim to be a better judge of paranormal matters than Professor Archie Roy, who spent more than 50 years studying and observing psychical matters, is beyond me. The “know-it-all” reads a few books by some debunker and he thinks he knows more than Roy learned over five decades. It took Roy 10 years to fully digest the cross-correspondences, but the “know-it-all” no doubt feels qualified to debunk it after a few hours of study. What arrogance! Hopefully, by now, Archie Roy has had an opportunity to meet Frederic Myers. They probably shook their heads in disgust while discussing such closed-minded hubris. 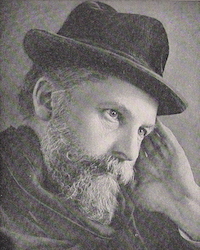 When he was alive in the flesh, George Pellew, an author, poet, and journalist, told Dr. Richard Hodgson, who was studying the mediumship of Leonora Piper, that he could not conceive of an afterlife but that if he died before Hodgson and found himself “still existing” he would attempt to let Hodgson know. 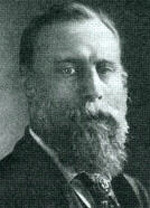 Hodgson (below) had been studying Mrs. Piper since 1887. He would arrange for various people to anonymously sit with her, and then would observe and record the sessions. The usual procedure was for Mrs. Piper to go into a trance state and her body to be taken over by a spirit calling himself Dr. Phinuit, who, unlike Mrs. Piper, spoke in a gruff voice and with a French accent. As it came to be understood by Hodgson and other researchers, very few spirits are capable of communicating directly and thus Phinuit would act as a medium on the Other Side, relaying messages from them to the sitters. Initially a skeptic, even a debunker, Hodgson had completely ruled out fraud on the part of Mrs. Piper but still questioned whether the voices coming through the young Boston medium in her trance state were voices of the dead or some secondary personality buried in her subconscious. But since many of the sitters seemed to be receiving very evidential information from deceased loved ones and friends, the question remained as to how the secondary personality, if that is what it was, got the information. Hodgson, Professor William James, and other researchers were reluctant to accept the spirit hypothesis. No evidence could be found that a Dr. Phinuit ever existed and they theorized that he was a secondary personality which was somehow able to telepathically tap into the mind of the sitter. When information came through that was unknown to the sitter but later verified as correct, they further theorized that it was possible for Mrs. Piper’s secondary personality to read the mind of anybody in the world or to tap into some kind of cosmic reservoir in the ethers and extract information, then feed it back to the sitters. As far fetched as that seemed, any explanation was preferable to spirits, as science, in the wake of Darwinism, was busy demonstrating that things spiritual were just so much superstition and folly. The mere suggestion of spirits of the dead was cause for smirks, scoffs, and sneers among educated people. 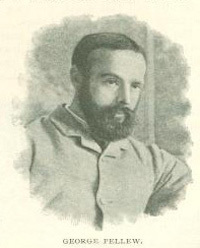 Hodgson’s confidence in his views was “shaken” after the accidental death of Pellew (below) on February 18, 1892, the result of falling down a flight of stairs. At the time, Pellew, a Harvard graduate, was employed as an editorial writer for the New York Sun. On March 22, a little over a month after Pellew’s death, Hodgson brought Pellew’s friend John Hart for a sitting with Mrs. Piper. Early in the sitting, Dr. Phinuit (speaking through Mrs. Piper’s body) announced that “George” was there. Phinuit then gave Pellew’s full name and the names of several close friends. To give assurance that it was actually himself communicating through Phinuit, Pellew told Hart that the pair of studs he was wearing were once his and were given to Hart by his (Pellew’s) parents, which Hart confirmed as true. Pellew then mentioned some mutual friends, Jim and Mary Howard, and asked Hart if he could get them to attend a sitting. He also brought up a discussion he had had with Katharine, the Howard’s 15-year-old daughter, about God, space, and eternity. As neither Hart nor Hodgson, who was also in attendance and taking notes, was aware of any such discussion with Katharine, this information, later confirmed by Katharine, fell outside the scope of simple telepathy. At a later sitting, the Howards brought their daughter, Katharine. G. P. came through and asked Katharine about her violin lessons, commenting (apparently jesting) that her playing was “horrible.” Not realizing the humor in it, Mary Howard spoke up to defend her daughter’s music, but G.P. then explained that he mentioned it because that is what he used to do when in the flesh. It was intended as verification of his identity. Over the period of time during which G.P. communicated, Hodgson brought 150 sitters, 30 of whom were known to G.P. when he was alive. In each case, G.P. greeted them by name. The non-recognition of the other 120 was contrary to the telepathic and cosmic soul theories. That is, if G.P., or Mrs. Piper’s secondary personality, had been reading minds or searching in some cosmic computer, he (she) would have known the names of all of them. The emergence of G.P. moved Hodgson and other researchers to a belief that spirits of the dead were in fact communicating. In effect, there was too much individuality, too much purpose and persistence, expressed by G.P. to attribute it to telepathy of a limited or expanded nature. It was one thing for a medium to tap into another mind or cosmic reservoir for information, quite another for that other mind or reservoir to dialogue with the fullness of a personality rather than just fragmentary bits of information.